Shane, Max, Madge and Danny are enjoying their usual rambunctious breakfast, bantering about all and sundry. Max thinks Shane needs to get a better job if he's still planning on getting married, but Shane thinks he's doing alright. Max then has a go at Danny for reading the paper at the table, but Danny snidely retorts that it gives him something to do. After he strops off, Max asks his family what's got up Danny's nose lately. Madge suggests he give Danny a bit of an ego boost. Walking into the lounge room, Max tries his best to give Danny a pep talk about how hard it is to adjust to the world after leaving school and how he'll soon make new friends. MAX: Just remember, this family thinks a lot of you, mate. We're behind you all the way. Daphne and Mike hurtle downstairs looking for Clive, skidding to a halt when they see he's meditating. Mike doesn't quite understand Clive's new hobby. DAPHNE: You know what Clive's like. He changes philosophies like he changes socks. Mike wonders how they're supposed to make breakfast without waking him up, so Daphne suggests tip-toeing. Suddenly, there's a racket as Scott bangs on the front door. Mike quickly ushers him upstairs so Clive isn't disturbed any further, but Clive's eyes snap open. He sneaks into the kitchen without Daphne seeing and resumes his meditating pose on the bench top, scaring the life out of her. He tries to give her his housekeeping money for the week, but Daphne won't accept it; she knows how strapped for cash he is at the moment. But Clive insists because the weekly money from Mike's parents hasn't arrived yet. Des and Zoe are sitting down for breakfast, (if you have this ep, watch for the boom mike that momentarily drops into the top of the scene), and Zoe is stressing about having to work with Paul after everything that's happened. Des suggests she resign but Zoe sighs and says Paul won't let her. Des then suggests that Zoe pull her head out of the sand and take a look at all the lives she's having an effect on because of her relationship with Jim - he hopes it's worth it. ZOE: It is, Jim means a lot to me. And it's about time his family realise he's got a life of his own. DES: Yeah well you better get the family onside - and that includes Paul. ZOE: I wouldn't waste too much sympathy on Paul, he's always telling me what a great survivor he is. 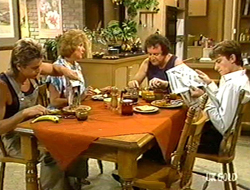 Shane and Clive stumble upon Paul eating breakfast and commiserate about him having to move out of home. Shane reckons that Zoe has always been trouble and didn't think she'd be Jim's type. He also wonders why Paul hired such a “dense head” for a secretary, but Paul says that Zoe is good at her job. Shane and Clive are then distracted by two female extras, sauntering along the bridge dressed like Julia Roberts' character in Pretty Woman - before she got the glamour makeover. The boys follow them like salivating dogs. Daphne has brought Des in for some advice and asks if she's entitled to some compensation, but Des says unfortunately she's not. He wonders what the new owners were going to do with the place and Daphne mutters that they're going to renovate it. Getting an idea, Des says that Daphne could set up again after they're done. Daphne knows it'll come at a cost to her (loss of income etc), but the idea has given her some hope. Zoe's surprised that Paul wants to buy Lassiter's seeing as he already lives there, but Paul thinks it's too good of a business opportunity to pass up. She doesn't think it's very practical (or comfortable) for him to be living in the hotel, but Paul advises her to start acting more like his secretary and not his financial consultant. Madge has brought over a boxful of pies for Daphne and they chat about how unfair the lease non-renewal is. Madge thinks Daphne could set up shop over at Jackson Terrace, but Daphne replies that it's got to be here or nowhere. Max and Des walk out of the bank, chatting about Bradley. 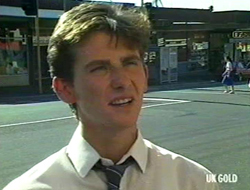 Des reveals that he's told Bradley he should get an after school job (isn't the kid a bit too young?). They bump into Danny and the conversation changes to Daphne losing her lease. Max reckons she should put up a fight, but Des says that she's trying to but legally she doesn't stand a chance. 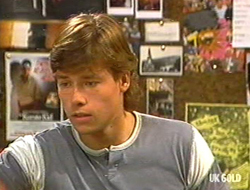 Danny reckons the renovations could be a good thing - if that part of Lassiter's is done up nicely then the property values in Erinsborough will go up. 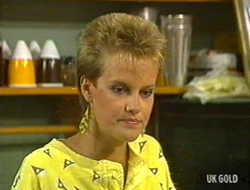 Daphne slams down the phone and angrily tells Clive and Shane that the owners wouldn't give her a straight answer as to why she couldn't renew her lease. CLIVE: Take it easy, Daph, your pupils are starting to dilate. The only thing they'd tell her is that some large corporation wants to modernize the building. Shane says it won't be all bad. They're still getting married - maybe Daphne could start to think about whether she wants to still work or not. Daphne is not impressed. DAPHNE: I am a resourceful, independent woman. I have done my darndest to build up the business and I am proud of that fact. DAPHNE: Well no one bothered to tell me we'd gone back to the dark ages. Daphne then reminds Shane that he's hardly a consistent breadwinner and doesn't know how they'd survive on his variable wage. Shane retorts that lots of families live on a wage like his, but he gets angry when Daphne says she's spoken to Des about what she wants to do. He follows her into the kitchen and asks if he's going to get any say when they get married. Daphne doesn't think he will if he keeps insisting on tying her to the kitchen sink. Shane wants to know why she goes running to Des every time she has a problem. Frustrated, Daphne says that he's demeaning himself with his stupid jealousy. Shane storms out. We switch to later in the day. Daphne and Mike are cleaning up when Clive walks in, wanting a chat with Mike. He lets him know that they haven't received any cheques from his parents for a fortnight. But it gets worse - Mike's dad knew nothing about the money. His mum must have been taking it out of housekeeping each month, and now his dad knows he's not letting her support Mike any longer. 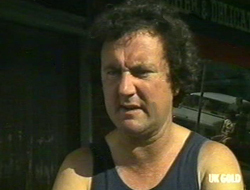 Mike frets, but Clive and Daphne rally around him and say they'll work something out. Max gathers the family for a meeting. He reckons they all take one another for granted so he suggests that they all take more of an interest in each other's lives. He reveals that he's been reading a “Yankee mag” that says they should talk about feelings and emotions more often. Madge hides her face behind her apron so she doesn't bust out laughing. Shane's also struggling to conceal his giggles and quickly heads out to see Daphne. Shane and Daphne are kissing and making up in the kitchen. Shane apologises again for being an idiot and Daphne says she only went to Des for business advice. She brings up Mike's situation, which will add to her money woes, and Shane says that Daphne could sell all her work equipment and invest the money. But that only leads back to the ‘one-income won't suffice' argument. Daphne resolutely says that she's going to keep her business afloat any way she can. SHANE: (teasing) You know a bloke could get a bit of a complex when his girl starts preferring the company of a cappuccino machine's to his. DAPHNE: But I meant what I said. I'm not turning my back on all of this. Coffee? Scott is strolling up the street when he notices someone trying to break through the window of #24. Yelling out, he runs up the front stairs of the house and confronts the intruder... Who proceeds to punch him in the face. Madge races out after hearing the commotion, and is quite shocked to see who Scott's with. Charlene sheepishly takes her hat off and smooths out her hair.